The tenements of 1865 London were the hidden scandal of a boisterous, industrializing England. The shadows of belching smoke stacks concealed the dumping ground of the dregs of English society. The foul stench of overflowing sewers and uncollected garbage permeated the air. The tenements - catch-basins of the disenfranchised, stalking ground of predators who fed on their misfortunes - were owned by unscrupulous slumlords who squeezed profits out of every square inch of putrid floor space. Octavia Hill was an impressionable adolescent when she first encountered the tenements. The daughter of privilege, though not of great wealth, Octavia was invited to accompany certain Christian ladies of social standing who ventured into these dark streets with soup, clothing, and genteel smiles. It was the children that initially captured her attention, the unkempt urchins who snatched and hoarded bread crusts like starving animals. On subsequent visits, Octavia would learn the names of several of the children and would follow them through the squalor to the dark, unpainted rooms their families called home. She would meet mothers too weakened by tuberculosis to provide even minimal care for their children. She would meet unemployed fathers stupefying themselves with rotgut to numb the pain of uselessness. By the time Octavia had reached her twenties, she was seized by a burning passion to find a cure for these awful conditions. In a bold move for a young woman of her day, Octavia made a business proposition to a wealthy capitalist who owned one of the tenements: entrust to her the office of property manager, reinvest all earnings back into the property for one year. In return, she would ensure a competitive rate of return and an improved property in subsequent years. The deal was struck. Octavia moved into the tenement as its resident manager and began mobilizing her tenants to unplug the sewers, cart away trash, patch leaking roofs, replace broken windows, and wash down walls. She collected rents in person, using these weekly visits as an opportunity to learn how each family fared. She instituted standards of appropriate conduct and enlisted the help of mothers and children to decorate the halls and plant flowers in the courtyard. She provided part-time maintenance work to the unemployed menfolk, taking care to offer this as temporary rent assistance rather than a substitute for permanent employment. Using her civic connections, she persuaded officials to increase police protection, street lighting, health care and other services. In one years’ time, Octavia Hill had transformed a dangerous slum into an attractive apartment building. And to the delight of the landowner, she turned a respectable profit in year two. Modern-day Atlanta can hardly be compared to Dickens’ London. But there is at least one similarity. Slumlords. The cheapest housing where our impoverished citizens live is largely owned by absentee landlords who care little about residents’ quality of life. And like Octavia Hill’s tenements, doors get broken down, windows get shattered, drains get plugged, roofs spring leaks. There is little incentive to do maintenance so long as tenants keep up their rent payments (however erratic). Frequent evictions take care of the complainers. There are always more renters waiting to fill a vacancy. Decent housing for the poor seems to be a perennial challenge. But in at least one inner-city Atlanta community, something is being done about the problem. 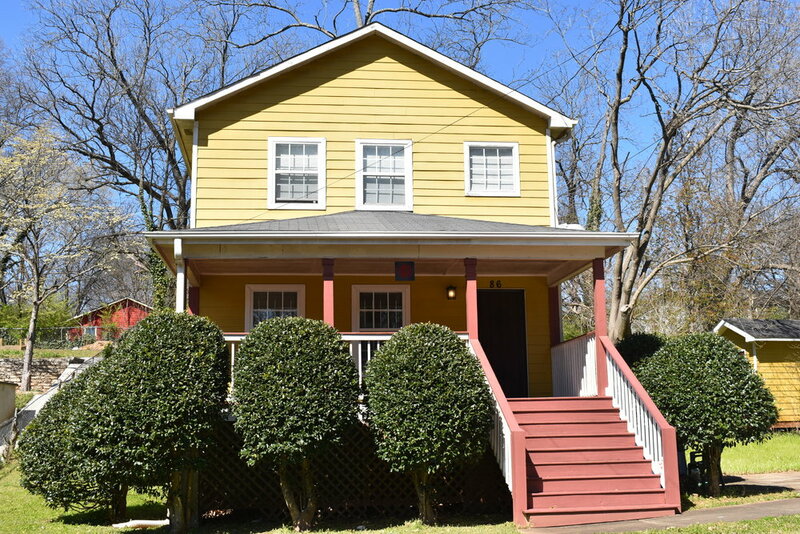 FCS has been buying up dilapidated properties in South Atlanta, restoring them to top condition, and renting them to families who need an affordable, quality place to live. A team of well-qualified construction, maintenance and management professionals ensure that standards remain high. They are applying Octavia Hill’s operating principles, ones dramatically changed London’s rental housing landscape. If there is one distinguishing non-negotiable that Octavia held to, it was the requirement to become neighbors among those they served. It just so happens that this is one of FCS’s guiding principles as well. Perhaps the time has come to inspire a fresh generation of capable, compassionate, business-minded visionaries to take on our city’s enormous challenge of providing quality, affordable housing for our most vulnerable citizens. If young Octavia Hill could do it, why not us?